Just be prepared for a bit of a learning curve. 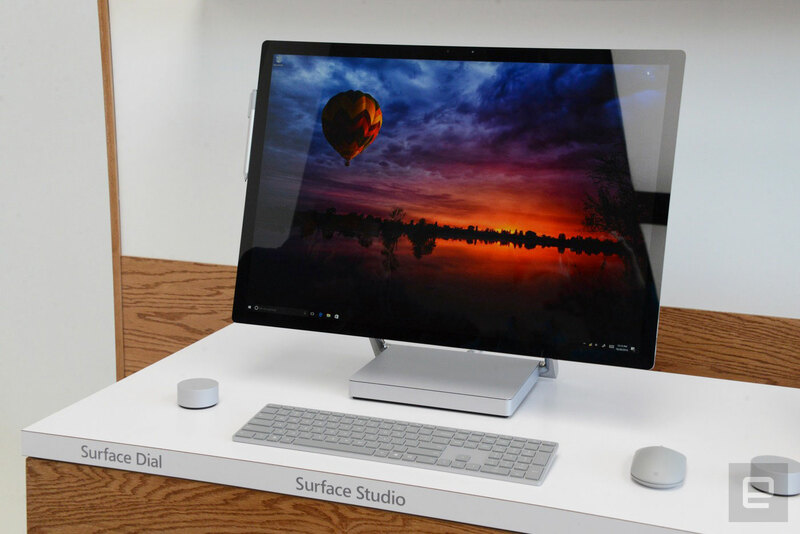 Microsoft just wrapped its event where it unveiled the new Surface Studio, and we had a few minutes to stare straight into the gorgeous display of the company's first all-in-one desktop. Based on how Microsoft introduced this new product, it's clear it's geared toward professionals and creatives, including visual artists, architects, writers and even accountants. The company thinks that being able to immerse yourself in a display of this quality, size and capability will change how people work. Unfortunately, in the glare-filled demo area at the event, it was hard to get a sense of just how brilliant the display is -- or what it's like to use the computer as Microsoft intends. Still, there's no doubt this is an impressive canvas. The 28-inch, 4,500 x 3,000 display looks extremely bright and sharp, as you'd expect, and the degree of thinness here is shocking. The relatively small bezels mean you lose yourself in the screen more than on just about any other device out there. And unlike many other computers that seem to have a thin design for no real reason, there's an obvious advantage here: The thin screen plus the highly engineered arm and hinge system mean it's easy to put this display at any angle you might want. Oddly, it reminds me a little bit of the iMac G4 that Apple made so many years ago -- that sense of being able to manipulate and move the display into just the right position for the work you're doing. All the polish we've grown to expect from the Surface line is on display here. The articulating hinge feels smooth. The display stays in place no matter what angle you choose while the screen stays steady even as you press down on it. That said, as I learned when trying it out, you'll want to keep your desk clear below it if you want it to tilt down to the maximum 20 degrees -- otherwise you'll squash your keyboard or anything else around it. Obviously, Engadget hasn't had a chance yet to put this machine through its paces, but I did get to try out the pen and Surface Dial. The responsiveness of the Surface Pen feels even better than on the Surface Pro 4 and Surface Book. It could also be that having a sturdy surface and a large display make it easier to write on a touchscreen. But the pressure sensitivity and overall response rate are both excellent. 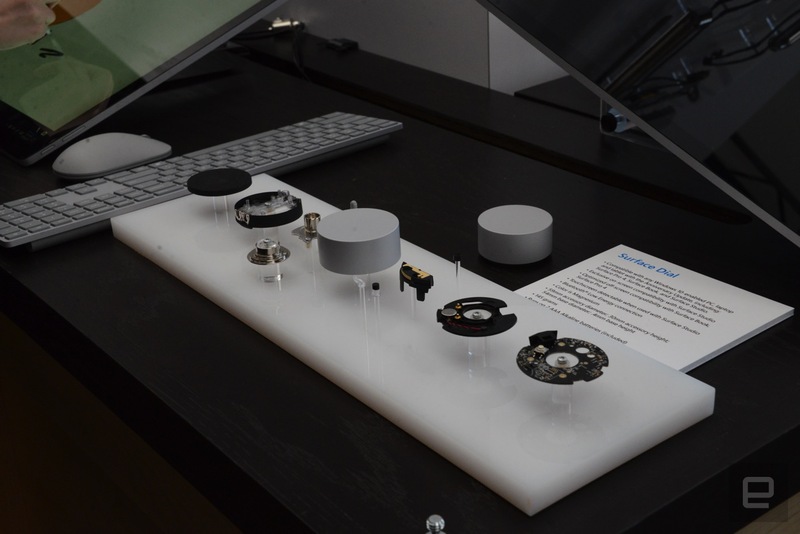 The optional Surface Dial accessory seems entirely new -- there's little to compare it to. This puck-shaped device feels incredibly smooth when you spin it to control different apps, and that's true whether you place it on a desk or on the screen. 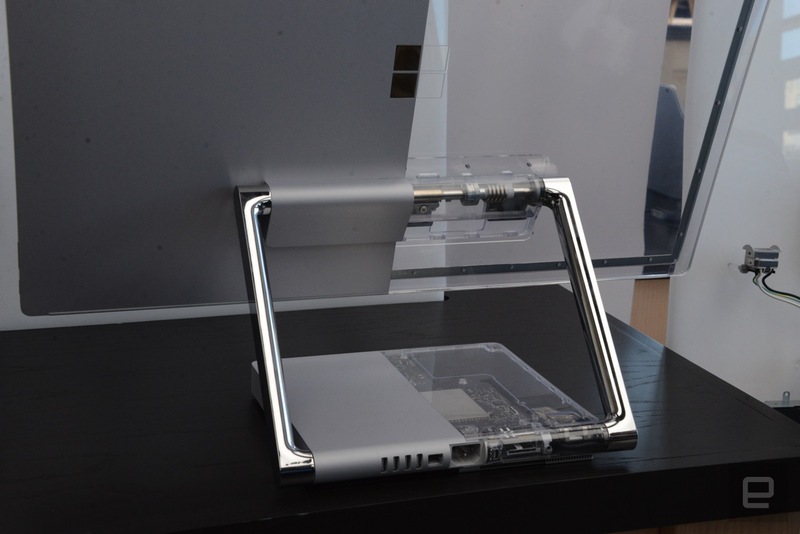 While there's nothing that makes it adhere directly to the Surface Studio display, there's some degree of friction that keeps it in place (when the computer is lying basically flat, anyway). It's meant for you to hold up on the display as you're using it. The Dial has different functions in every app. In Word, for instance, it could help with formatting, while in Photoshop it could help you manage your palette. It feels great in your hand too -- as well-constructed as the Studio itself. But it seems there will be a bit of a learning curve for most people. It's going to be up to developers to integrate the Dial in a way that makes it a compelling accessory, but we imagine at the least Microsoft's first-party apps will all have clever Dial functionality built in by the time the Studio ships. As for ports, there's not much of note here -- not surprising, given how small the actual box holding most of the components is. There are four USB 3 sockets, an SD card reader, a mini DisplayPort connector, an Ethernet jack and a headphone jack. It's not a bad array, but a few USB-C slots certainly wouldn't have hurt. Microsoft's new wireless keyboard and mouse also feel great, but that's long been true of the company's input devices. The keyboard offers a good amount of travel, making it easy to quickly pound out sentences without issue. The mouse's curve feels nice against the hand, and the click sounds are satisfying too. Ultimately, my first impressions of the Surface Studio are that it's a remarkable display of engineering, from the thin display to the hinge to the way the Dial interacts with the touchscreen. But it's going to take a lot more time and testing to say if Microsoft's vision of how people can use this computer to create and get things done makes sense. That said, even if you don't want to put the screen down in canvas mode and start drawing on it, it still appears to be a hell of a computer, one we're looking forward to testing as soon as possible. If you want to try it yourself, you can preorder the Surface Studio starting today for $2,999, with delivery expected in mid December. Microsoft did say that supplies will be limited this year, so if you have your heart set on this machine, don't dawdle. Devindra Hardawar contributed to this report.